THE FUTURE of the Toronto Blue Jays wakes up in a 1978 Volkswagen camper behind the dumpsters at a Wal-Mart and wonders if he has anything to eat. He rummages through a half-empty cooler until he finds a dozen eggs. "I'm not sure about these," he says, removing three from the carton, studying them, smelling them and finally deciding it's safe to eat them. While the eggs cook on a portable stove, he begins the morning ritual of cleaning his van, pulling the contents of his life into the parking lot. Out comes a surfboard. Out comes a subzero sleeping bag. Out comes his only pair of jeans and his handwritten journals. A curious shopper stops to watch. 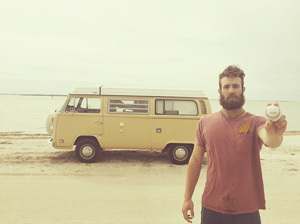 "Hiya," Daniel Norris says, waving as the customer walks away into the store. Norris turns back to his eggs. "I've gotten used to people staring," he says. This is where Norris has chosen to live while he tries to win a job in the Blue Jays' rotation: in a broken-down van parked under the blue fluorescent lights of a Wal-Mart in the Florida suburbs. There, every morning, is one of baseball's top-ranked prospects, doing pull-ups and resistance exercises on abandoned grocery carts. There he is each evening, making French press coffee and organic stir-fry on his portable stove. There he is at night, wearing a spelunking headlamp to go with his unkempt beard, writing in his "thought journal" or rereading Kerouac. He has been here at Wal-Mart for long enough that some store employees have given him a nickname -- "Van Man" -- and begun to question where he's from and what he might be doing. A few have felt so bad for him that they've approached the van with prayers and crumpled bills, assuming he must be homeless. They wonder: Is he a runaway teen? A destitute surfer? A new-age wanderer lost on some spiritual quest? The truth is even stranger: The Van Man has a consistent 92-mile-an-hour fastball, a $2 million signing bonus, a deal with Nike and a growing fan club, yet he has decided the best way to prepare for the grind of a 162-game season is to live here, in the back of a 1978 Westfalia camper he purchased for $10,000. The van is his escape from the pressures of the major leagues, his way of dropping off the grid before a season in which his every movement will be measured, catalogued and analyzed. If a baseball life requires notoriety, the van offers seclusion. If pitching demands repetition and exactitude, the van promises freedom. "It's like a yin-and-yang thing for me," he says. "I'm not going to change who I am just because people think it's weird. The only way I'm going to have a great season is by starting out happy and balanced and continuing to be me. It might be unconventional, but to feel good about life I need to have some adventure." On this morning, Norris' adventure turns out to be the van itself. He finishes breakfast and turns the key in the ignition, and the engine refuses to start. "Come on, old friend. You can do this," he says, gently patting his hand against the dashboard. He is due at the Blue Jays' spring training facility in an hour for a workout, a massage and a throwing session. He tries the key again, and the engine erupts like a firecracker. Gas leaks onto the parking lot and a cloud of smoke shoots out from the tailpipe, but the VW makes it into gear. "There you go," Norris says, talking again to the van. "Back on the road. Just you and me." He bought the van in 2011, a few weeks after signing his first contract out of high school with the Blue Jays, and the VW has been his best friend and his spiritual center ever since. He named it Shaggy after a character in "Scooby Doo." He sings it songs and writes it poems and gives it Valentine's Day cards. He takes it for hiking expeditions in the mountains of Tennessee and surfing trips along the Carolina coast. He drives it each year to spring training in Florida, and this year he stretched that trip out over a few weeks. He drove without a schedule from his home in Tennessee, avoiding the interstate and exploring the dirt roads of Appalachia, sleeping each night in the crawl space behind the driver's seat with his head tucked against the back door. When he finally arrived in Florida, he parked illegally on the beach and camped inside the VW until local police evicted him and offered directions to the 24-hour Wal-Mart, his home ever since. Now he pulls out of Wal-Mart and drives three miles through Dunedin, squeezing the VW into a parking spot among his teammates' luxury sports cars and tinted SUVs. He sits in the back of the van to heat water for coffee. A few Blue Jays stop by on their way into the facility and watch Norris fiddle with his stove. The pilot light doesn't seem to be working. The water is still cold. "Why don't you just, like, go get something normal to eat," says another young pitcher, Marcus Stroman, reminding Norris that the team provides free coffee inside. "Don't you think this is kind of crazy?" "Not to me," Norris says. "To me this is the way that makes sense." 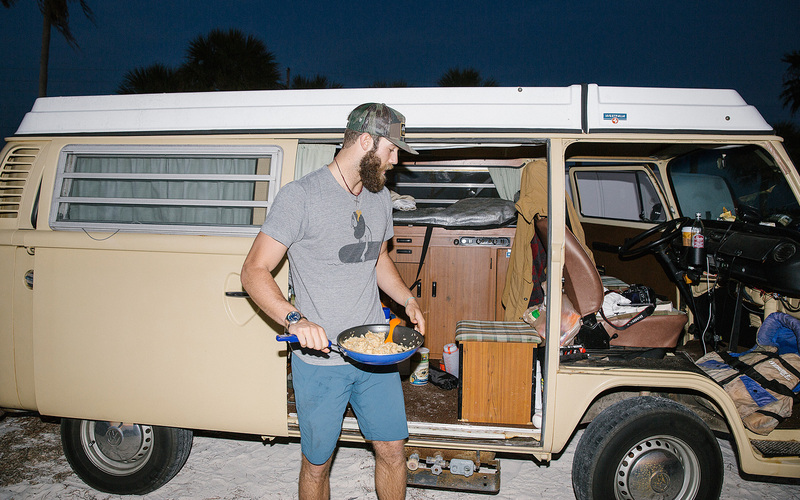 Daniel Norris, a high-ranking prospect with the Blue Jays, spends his offseason living in a van down by the river. "Nonconformist," reads one sign posted inside his VW. But all professional sports value their conformists -- athletes who sacrifice individuality for team, and whose predictable behavior elicits predictable results. Perhaps nowhere is consistency more valued than in baseball, a game whose self-reverence for tradition and purity might be contributing to its fading place as America's pastime. The history of the game is valued above any one major league season; the integrity of a season is valued beyond any one team; the identity of a team is more important than that of its players. Flashiness of any kind is discouraged, and so players such as Yasiel Puig have to defend themselves simply for celebrating a home run. In the game's unwritten code, drawing individual attention is considered unbecoming, if not downright unsportsmanlike. Before the Blue Jays understood his convictions, Norris felt like the team had trouble making sense of his unpredictable life -- coaches, teammates and executives asking him questions that indicated a measure of unease. Why, with seven figures in the bank, did he take an offseason job working 40 hours a week at an outdoor outfitter in his hometown of Johnson City, Tennessee? Would it do permanent damage to his back muscles to spend his first minor league season sharing an apartment with two teammates in Florida and sleeping only in a hammock? Why had he decided to spend his first offseason vacationing not on a Caribbean cruise with teammates or partying in South Beach but instead alone in the hostels of Nicaragua, renting a motorcycle for $2 a day, hiking into the jungle, surfing among the stingrays? And was that really a picture on Twitter of the Blue Jays' best prospect, out again in the woods, shaving his tangled beard with the blade of an ax? unconventional. And yet for some reason, in Norris' case, it also seemed to be working, so the team's curiosity never rose to the level of complaint. "He takes care of himself as well as anybody we've got," says Tony LaCava, Toronto's assistant general manager. "He's in great shape. He competes on the mound. If that wasn't the case, maybe we'd be more worried about some of the other stuff. But right now, the van and all that is secondary. He has great values, and they're working for him." Last season, Norris started the year in Class A, led all of the minor leagues in strikeouts per nine innings and climbed steadily into the major leagues, appearing in five games for the Blue Jays in September. Suddenly, Van Man was taking private planes to Boston and New York, striking out David Ortiz, packing his teammates' beer bags for the flight as part of a rookie hazing ritual but still refusing to drink himself. He usually set his alarm early on the road and headed into the city with a camera to explore. "Start behaving like a big leaguer," one player teased him, but what so many teammates didn't seem to understand was that conventionality was the exact thing Norris was hoping to avoid. He was terrified of living by someone else's code. For almost 80 years, his father and grandfather owned and operated a small bicycle shop in car-dependent Johnson City, and their store was not only a place to sell bikes but a way to spread their family values and popularize a belief system. Play outdoors. Love the earth. Live simply. Use only what you need. Norris spent his childhood outside with his parents and his two older sisters, going for weekend bike rides and hiking trips, playing football, basketball and baseball. In school, he was a varsity star in all three, but it was baseball -- and particularly pitching -- that most aligned with his personality. Being alone on the mound reminded him of being out in the wild, where he was forced to solve his own problems and wrestle with self-doubt. "I was a good pitcher because I was already good at taking care of myself," he says. "I love having teammates behind me, but I'm not going to rely on them. It can get quiet and lonely out there when you're pitching, which drives some people crazy. But that's my favorite part." By midway through his freshman season in high school, he was one of the best players on varsity, and the stands began to fill with regional scouts. Soon, agents like Scott Boras were coming to see him in his father's bicycle shop. In June 2011, the Blue Jays drafted him in the second round. The team said it wouldn't offer Norris a contract until the end of the summer, so Norris' agent advised him to take a few months off, avoid injury and wait for the money to roll in. "Yeah, that's not going to fit with my style," Norris told him, then ignored the advice and did something virtually unprecedented for a top prospect. He moved to Atlanta to spend the summer playing center field for an amateur team, risking his career with nobody watching in the stands simply because he wanted to be playing baseball outside. On the morning in 2011 when his $2 million signing bonus finally cleared, Norris was in Florida with the rest of the Blue Jays' new signees. All of their bonuses had been deposited on the same day, and one of the players suggested they drive to a Tampa mall. They shopped for three hours, and by the time the spree finally ended they could barely fit their haul back into the car. Most players had spent $10,000 or more on laptops, jewelry and headphones. Norris returned with only a henley T-shirt from Converse, bought on sale for $14. It's been a fixture of his wardrobe ever since. It unsettled him in those first months to see so many zeros on his bank account balance -- "Who am I to deserve that?" he wondered. "What have I really done?" -- so he hired financial advisers and asked them to stash the money in conservative investments where Norris wouldn't have to think about it. His advisers deposit $800 a month into his checking account -- or about half as much as he would earn working full time for minimum wage. It's enough to live in a van, but just barely. "I'm actually more comfortable being kind of poor," he says, because not having money maintains his lifestyle and limits the temptation to conform. He never fills Shaggy beyond a quarter tank. He fixes the van's engine with duct tape rather than taking it to a mechanic. Instead of eating out with teammates, he writes each night in a "thought journal" that rests on the dashboard. "Research the things you love," he wrote one night. "Gain knowledge. It's valuable." "Be kind. Be courteous. Love others and be happy. It's that simple." "Where else can you be as free as by yourself in the middle of nowhere, or in the middle of the ocean, or on the peak of a mountain. Adventure is freedom." Twenty-five pitches at 90 percent effort, all of them fastballs aimed low in the zone. But before he can throw off the mound, there is an intensive warm-up that takes at least an hour. He weighs in at 192 pounds, with 6 percent body fat. He showers to relax his muscles. He loosens his shoulder. He stretches with the help of a trainer and walks out to a field of artificial turf, where the yardage is marked. He plays catch with a teammate: 10 throws from 30 feet, 10 from 60, 15 from 120 and another 10 from 60 feet. He walks to the bullpen and digs into the mound. Two trainers and four coaches watch as he finds his footing. One records a video from the left, another records from the right. "Twenty-five pitches," says Dane Johnson, the team's bullpen coach, and Norris stares down the catcher and counts the pitches in his head as he throws. Sometimes during these moments on the mound, his arm feels almost foreign to him -- like a gift, a fluke, all those fast-twitch muscles that for some reason just know how to fire. Twenty pitches left now. Fifteen. Twelve. Nobody else in his family was an athlete, yet for some reason he is ranked the 18th-best prospect in the major leagues, a strikeout specialist with a fastball that ramps up to 96 miles per hour, a sharp slider and a 12-6 curve -- what scouts consider the best natural "stuff" in the Blue Jays organization. He has a good chance to win the final starting spot in the rotation and begin the 2015 season in the major leagues. Eight pitches left now. Six. "I am always trying to figure out why I can throw like this, because it doesn't make any sense," Norris says. He loves the craft of pitching, obsesses over it and dreams about four-seam fastballs, but he dreams about other things, too. Five pitches left now. Three. Two. He wants to go backpacking in Banff, publish his photography in the Patagonia catalog, surf in Hawaii, go rock climbing in Oregon. He wants to be a great pitcher, but so much else, too. "OK. That's 25," Johnson says. "Go cool down," says George Poulis, the trainer, and Norris returns to the team's indoor facility for another stretching routine, another shower, another massage. By the time he finally leaves the facility, it is early afternoon, and he has thrown 25 pitches in six hours. He opens Shaggy's driver-side door, and his cellphone vibrates with a new text from a coach. It is the slow-motion video of his workout, accompanied by a short message of instruction: "Focus on the details." HE DRIVES AWAY from the field, beyond the sprawling suburbs of the Gulf Coast and out toward the beach. He stops to buy groceries for dinner -- a package of raw chicken and stir-fry vegetables for $11.50, a splurge. Then he continues beyond the coast onto a two-lane causeway, a strip of road in the middle of the water, where he can pull off and park Shaggy directly on the sand. This is his favorite beach in Florida, a 25-foot stretch of sand separated from the road by a line of palm trees, a place so public that nobody else seems to notice it. The traffic cruises by on the causeway at 50 miles an hour, and he has the beach to himself. He comes here to paddleboard, to read and to journal. Once, after a morning in the water, he returned to the beach and fell asleep on his surfboard. A few hours later, he felt the cold chill of water on his foot and awoke to see that the tide had risen and swept him back out into the ocean on his board. He was quite a distance from shore, out there by himself, disoriented and scared. "That was one of the best moments of my life," he says. Now he watches the sun dip toward the horizon as his dinner cooks on a portable stove. He calls his father and lets him listen to Shaggy's engine over the phone. "Sounds pretty good, right?" he says. He receives a message from his mother: "We're proud of you for being you," she tells him. He sets down his phone and puts on sunglasses. Gulls dive into the water. Waves crash onto the beach. The sunset paints his van in oranges and blues. 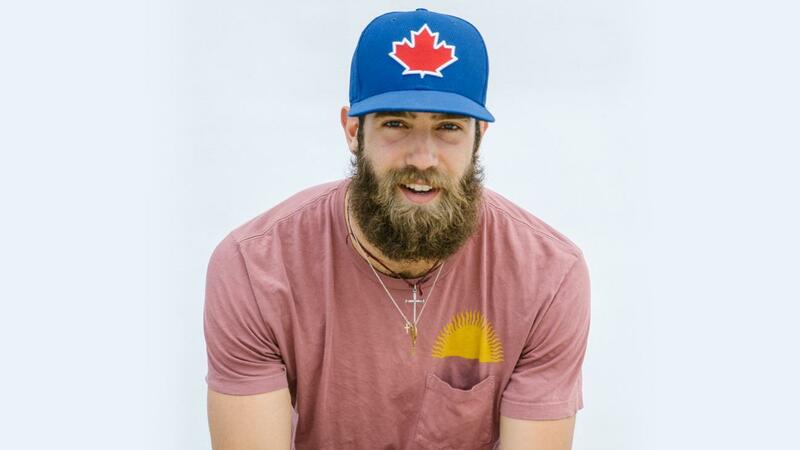 Soon the season will begin in earnest, and he will eventually shave his beard and move into a teammate's house -- two concessions to the pressures of the major leagues. He wants the Blue Jays to know he takes his job seriously. "There are some things that I'm just going to have to get over," he says. "I can't be by myself all the time. I can't live the total minimalist life. I guess I'm going to have to figure out where and when to give in. How much is necessary? How much feels right?" He sometimes senses the assumption from other players and fans that his eccentricity is just a passing phase. Will he really continue to live in a van if $2 million becomes $50 million? Will he still have a thought journal when he's not just a fringe baseball curiosity but a star? How can even the most ardent nonconformist survive the pressures of mainstream fame, corporate sponsorship and the traditionalism of the game. "What I'll do, if baseball goes well, is I'll become even more of an ambassador for the things I really care about," he says. "I'll make sure Shaggy's still running. I'll pioneer change in how sports thinks about the environment." He wants to make fans more aware of the earth and make stadiums less wasteful. But now it is just Van Man and Shaggy alone on the beach, and the pressure is mostly abstract, and there's no one to judge him and no reason to conform. He walks toward the surf, and the wind whips against his jacket. The sky shows its stars, and he tries to name them. The moon is nearly full, and its light casts his shadow across the beach. Norris takes out his camera and starts photographing everything he sees: the shadow, the van, the stars, the road. "I have to capture this," he says, because it is another night on a deserted beach and he is at ease, and maybe he can hold on to the moment. Maybe he can make it last. Join the conversation about "The Man in the Van."